I love Si Kahn. I love the way he makes me feel when I meet him and when I listen to his music. In my role as a folk music radio broadcaster, I hear a lot of music and work many long hours, so it is easy for me to feel jaded and critical - especially in this Northeastern quadrant of the U.S. that I live in, where living to work has become the norm. When you meet Si and listen to his music, you are immediately struck with his genuine feeling for you. He is a kind man, and his songs reflect that kindness and strength of personality. They are empowering but nurturing, written with a sense of place. There is a history to all of his songs. He has been there. Si came up through the civil rights and union struggles of the sixties and seventies and has continued beyond. This grandson of Russian, Polish, Lithuanian and Austrian Jewish immigrants and a Harvard graduate has made it his mission to organize those who feel powerless, those who feel trapped. Si founded Grassroots Leadership in 1980, an organization that "works to build the infrastructure for a Southern movement, including the leaders, organizers, organizations, networks and coalitions that will make long term progressive change inevitable." His songs are an extension of that mission. 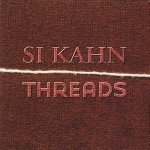 I have been lucky enough to hear Si Kahn's music progress over the past twenty years. It is a powerful punctuation point to his every-day job as a tireless worker for America's workers and the oppressed. But if you listen to this music, you know that. His lyrical poetry paints powerful, simple portraits of workers from the mills of Lowell to the coal miners of West Virginia and cotton pickers of the South. These are folks who in this period of 'prosperity and economic boom' are the invisible. Si's songs place you directly in the middle of a cotton field with dreams of escaping "High Cotton," or in a small room, with a boss plying a young worker with the promise of better working conditions for sexual favors. As you listen to "Moose Lodge" you're in a club (it could be anywhere, but I instantly placed it in upper Maine) where the tired workers are putting their lives in perspective, while the young bulls rev their cars in the old town square. His songs speak of love and of respect. Si's songs are also lovely. While the lyrics are strong and to the point, his melodies are simple and compassionate, with choruses made for the single voice or the masses. The core of contemporary folk music is the poetry of Woody, Pete, Phil, Tom and Si. These are folks who have a vision not shared by all of us. I truly believe that a higher persona has given them the power to see beyond the horizon of life. They are vehicles for songs of strength. These folks and others paved the way for the current explosion of songwriters, who in many cases have lost that vision. It is up to singers like Si to bring them back. Si's job with Grassroots Leadership is to bring people together to achieve a common goal. He is an organizer. His job as a singer and a songwriter is to bring all of us closer to understanding and to feeling. If the 90's and the new millennium had the power of Si's music, we would be working toward a different place. I often hear the cry of folks mourning for the civil rights music of the '60's - or the unifying music of Pete Seeger. We still have it with Si Kahn. It is too easy for all of us to slip back into the jobs of feeding our families, feeding our intellect and feeding our competitive nature. We need to stop and look around. When I listen to Si, he helps me do just that. As folk music should, Si brings us back to the place we should be.